Back in 2016 the talking heads on tv kept expecting candidate Trump, who made headlines almost daily saying racist and offensive things, to “transition.” Their theory was that he was acting out for his base in the GOP primaries but then would dial it back in the general election. Months into his presidency, and he’s the same Donald Trump, a bull in the china shop of global diplomacy. The disaster for US relations (which is already hurting the US economy through a fall in tourism and investment from abroad) went from the personal to the substantive. Then there was that awkward moment when he refused to affirm the US commitment under article 5 of NATO to come to the defense of members of the alliance. NATO invoked article 5 and sent tens of thousands of troops to Afghanistan for a decade after 9/11, but Trump isn’t about gratitude or appreciation of others. The omission was significant because after Vladimir Putin’s unilateral annexation of Crimea from Ukraine and then interference in East Ukraine, European countries are depending on the US to see that the Russian Federation does not go any further. I know that Crimea belonged to Russia until Khrushchev lightly transferred it inside the Soviet Union to Ukraine in the early 50s, and that there were legitimate Russian concerns about where Ukrainian politics were going and how they would have an impact on the 2 million Russian-heritage Ukrainians in the east. And I know that NATO made a huge error in being aggressive toward the supine Russian Federation and seeking to expand right up to its doorstep, contrary to what the US promised Premier Mikhael Gorbachev. But also in today’s world you can’t do things like annex and intervene unilaterally and by fiat, with no semblance of the rule of law. Crimea should have a referendum under UN auspices and the Minsk process should end in normalization and restoration of rule of law. And if you know the history of Poland, which Russia at some points arranged not to exist at all, you understand the fears, and the significance of Trump’s refusal to allay them. Or the further awkward moment (does he have any other kind?) when lectured other NATO members about putting more money into the organization and complained about how much their HQ in Brussels must have cost. I think Europe can afford a building in Brussels. 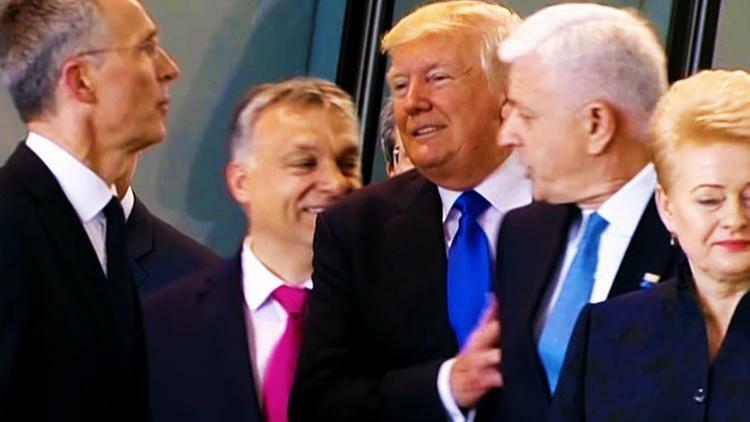 There was that shove he gave the prime minister of Montenegro in his rush to get in front of the cameras, for all the world like a five year old in the kindergarten lunch line. Or there was the interview he gave in the German press where he displayed that he wasn’t paying attention at the Wharton School when he took macro-economics 101. Uh, it isn’t actually bad for the world economy for Germany to sell cars to Americans. Americans got to be the world’s biggest economy by selling cars to other people. More trade is good. American consumers get German engineering. Consider this little item from WaPo, which says that GM now sells more cars in China than in the US: “The company sold a record 3.9 million cars in China last year, with its Chevrolet, Buick and Cadillac brands proving especially popular.” Protectionism of Trump’s sort could potentially cause the countries of the world to slap punitive tariffs on US goods, driving the world, and the US, into a Great Depression that would make 2008 look like a spring picnic. GM had been on the verge of breaking even in its European operations last year, WaPo says, when Brexit happened and introduced such uncertainties into the market that the GM executives just decided to sell Opel etc. and turn to Asia. Trump very publicly supported Brexit, which means he encouraged developments that harmed US manufacturing. That is, insular white nationalism of the sort that drove the British exit from the European Union has already hurt the bottom line of American manufacturers. As for the US auto market, it is saturated and GM can’t hope for growth there. You know what is going to be a growth sector for the automobile industry? Electric cars, to which the Paris Accords are going to give a huuje boost. Trump is encouraging through deregulation dirty petroleum cars that put out toxic carbon dioxide, which endangers people’s lives. In the meantime, Asian powers like China and India rush to dominate the auto market of the future, electric. It is the Chevy Bolt that gives hope for GM’s future, not protectionist tariffs. Who has oil to sell, to fuel the dirty cars? Russia and Saudi Arabia, Trump’s (and Rex Tillerson’s) authoritarian buddies. If a Kremlin covert ops team had actually found a way to program a US president’s visit to NATO and the G7, they couldn’t have done a better job of disruption than Trump did just by being Trump.